Low inflation could be a positive catalyst for these three stocks and here's why. If inflation rises in the coming years as many experts are predicting, there are many stocks that are likely to do very well. For example, when inflation rises, prices of consumer goods generally rise along with it, so retailers could perform well in an inflationary environment. Dan Caplinger: Interest rates and inflation are inexorably tied together, especially as the Federal Reserve contemplates how quickly to restore short-term rates to more historically normal levels. If inflation remains low, then you can expect the Fed to be slow in its future rate hikes, and that's good news for stocks like Verizon (NYSE: VZ) that pay high dividend yields yet also have considerable levels of debt on their balance sheet. Low rates have been extremely useful for Verizon. On one hand, they've helped keep investors interested in the stock's roughly 4.5% dividend yield, with quarterly payouts that look incredibly attractive compared to the rock-bottom rates available on typical fixed-income investments like bonds and bank CDs. Yet low rates also made it possible for the telecom giant to complete its acquisition of the remainder of its Verizon Wireless unit, with the company issuing a record amount of debt to get the deal done. If inflation stays low, then Verizon will be able to refinance the shorter-term portion of its corporate debt at equally low rates, saving it from potential increases in interest costs that could endanger its ability to sustain and grow its dividend in the future. That would be a big positive for the telecom company and give it more flexibility to search for growth-enhancing corporate strategies going forward. Matt Frankel: Inflation and interest rates tend to move together, as you can see in the chart below. In fact, one of the Federal Reserve's most important criteria for raising rates is the inflation data. So, if inflation remains low, it could provide a boost to stocks that rely on low-interest financing to drive demand for their business -- and homebuilders definitely fall into that category. The current 30-year mortgage rate is 3.8%, and a spike to even 5% would mean a $177 difference in the monthly payment on a $250,000 mortgage, which could result in a significant drop in demand, or a drop in home prices. 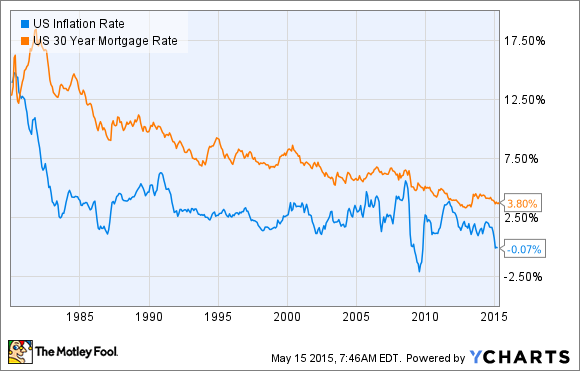 On the contrary, if rates stay low, homebuilders could see stronger-than-expected sales. Within this category, I believe D.R. Horton (NYSE: DHI) is best-in-breed, and not just because it has closed more home sales than any other builder for 13 consecutive years. The company has produced impressive year-over-year growth, with a 33% increase in net sales, and a 27% boost in the backlog of homes. The company is off to a strong spring start this year, which seems to bode well for the company as it heads into the historically strong summer selling season. Finally, with so many experts calling for interest rates to rise later this year, I have to believe that the effects of rising rates are somewhat priced into D.R. Horton's share price. If the Fed decides to wait, or to increase rates slower than the market expects because of unexpectedly low inflation, it would be good news for D.R. Horton shareholders. Sean Williams: If inflation somehow continued to traipse along at 2% or less, which would be notably below its historical average, I, like Dan, would prefer to own a company with an above-average dividend, but also one that has superior pricing power, even in an environment where pricing power comes at a premium. For that, I'm turning to healthcare conglomerate Johnson & Johnson (NYSE:JNJ). Johnson & Johnson is part of an elite class of dividend-paying companies known as Dividend Aristocrats which have increased their payout in a minimum of 25 straight years. J&J is among the most elite of the group, with a 53-year streak of increasing its payout to shareholders. Currently, J&J's annual yield of 3% (based on its latest payout increase) places it nicely ahead of the current inflation rate, meaning investors could be netting real, not just nominal, money gains. More importantly, J&J can use its brand-name products, size, and exclusivity to increase the pricing on its products in both low and high inflation environments. Its well-known brand-name consumer products line tends to perform well in any economic environment, while its pharmaceuticals segment is the true star. Johnson & Johnson's focus on high-growth therapeutic indications, such as oncology, allow it to set the bar high on treatment pricing and all but ensure it can recoup its R&D expenses to create a host of drugs as well as outpace nearly all levels of inflation. Insurers and consumers rarely question pharmaceutical pricing and increases, making J&J a potentially sneaky play in a low inflation environment. Homebuilder Stocks Downgraded: Is It Time to Panic? D.R. Horton Withstood the Housing Slowdown This Quarter. Can It Keep It Up?